Instead of recording images on film, digital cameras store pictures on memory cards. Your Nikon D7100 uses a specific type of memory card — an SD card (for Secure Digital). To enable you to shoot oodles of pictures without having to swap out cards, the D7100 has two card slots. Open the cover on the right side of the camera to reveal them. The top slot is Slot 1; the bottom slot is Slot 2. Understanding card specifications: Most SD cards carry the designation SDHC (for High Capacity) or SDXC (for eXtended Capacity), depending on how many gigabytes (GB) of data they hold. SDHC cards hold from 4GB to 32GB of data; the SDXC moniker indicates a capacity greater than 32GB. Cards are also assigned a speed rating from 2 to 10, with a higher number indicating a faster data-transfer rate. The Powers That Be recently added a new category of speed rating — Ultra High Speed (UHS). UHS cards also carry a number designation; at present, there is only one class of UHS card, UHS 1. These cards currently are the fastest the planet has to offer. Of course, a faster card means a more expensive card. But to maximize your camera’s performance, make the investment in Class 10 or UHS 1 cards. Especially for video recording, a faster card translates to smoother recording and playback. A faster card also can improve performance when you’re shooting a burst of images using the camera’s continuous capture feature. Inserting a card: Turn off the camera and then place the card in the slot with the label facing the back of the camera. Push in the card until it clicks into place; the card access light (labeled in the figure) blinks for a second to let you know the card is inserted properly. Removing a card: After making sure that the card access light is off, indicating that the camera has finished recording your most recent photo, turn off the camera. Open the memory card door, depress the memory card slightly until you hear a little click, and then let go. The card pops halfway out of the slot, enabling you to grab it by the tail and remove it. 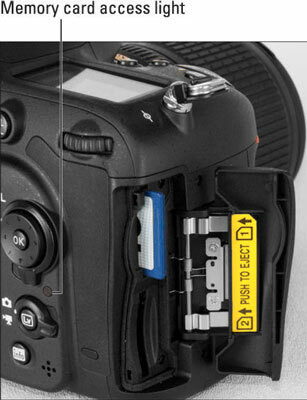 When both memory card slots are empty, the symbol [-E-] appears in the shots remaining area of the viewfinder, Control panel, and Information screen. If you have a card in the camera and you get these messages, try taking the card out and reinserting it. Handling cards: Don’t touch the gold contacts on the back of the card. (See the right card.) When cards aren’t in use, store them in the protective cases they came in or in a memory card wallet. Keep cards away from extreme heat and cold as well. 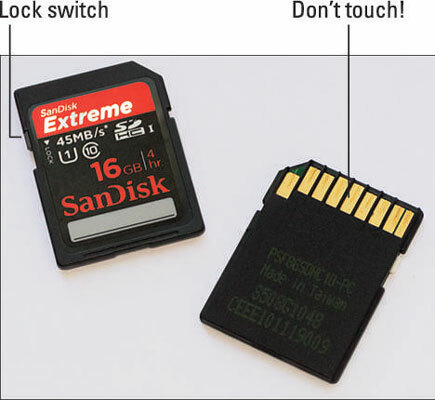 Locking cards: The tiny switch on the side of the card, labeled “Lock switch,” enables you to lock your card, which prevents any data from being erased or recorded to the card. Press the switch toward the bottom of the card to lock the card contents; press it toward the top of the card to unlock the data.